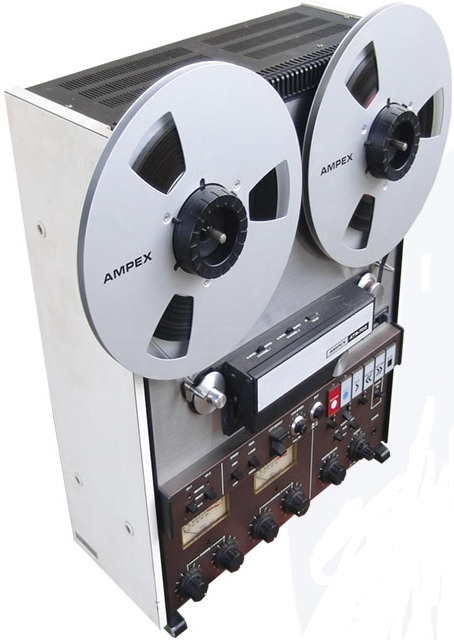 The ATR-700 is a highly reliable, professional audio magnetic tape recorder/reproducer designed for use with 1/4-inch tape and 5, 7, or 10-1/2-inch reels. It is available in six versions; all are switch-able between NAB and IEC equalization. Each unit offers two selectable speeds; 7-1/2 and 15 in/s in the high-speed models, and 3-3/4 and 7-1/2 in/s in the low-speed models. The ATR-700 is available in three different head configurations; full track, two track, and quarter track with either one or two channel capability. All units include two channels of electronics, allowing easy conversion of full-track units to two track or quarter track operation. The electronics of the ATR-700 feature IC logic controlfor error-free operation. Motion sensing logic allows changing from fast forward or rewind mode to reproduce mode smoothly and without tape spillage or damage. Reproduce triode begins shortly after the motion sensing circuitry determines that tape motion has stopped. No preset or automatic delays are necessary. The direct drive dc servo capstan motor provides positive tape control unhampered by belts that could introduce wow and flutter or tape speed variations. The standard ATR-700 utilizes three heads: an erase head, a record head, and a reproduce head. A space is reserved on the right side of the head assembly for installation of a fourth head (a second reproduce head), which may be ordered as an option. Changing a head assembly is a simple operation and requires only minor adjustments. Two-channel versions feature the synchronous reproduce mode which makes it possible to switch the record head of either channel to the reproduce mode for monitoring that channel. Thus, channels recorded at different times are in perfect synchronization. The two-channel ATR-700 has a built-in "four-in/two-out" mixer (two-in/one-out for each channel). Four microphones, four line inputs, or two microphones and two line inputs can be mixed down to two channels. For full-track models, two inputs can be mixed down to one channel. MIC ATT switches on the rear connector panel allow selection of 20 dB of microphone input attenuation. In addition, the three-position RECORD LEVEL switch selects three levels of attenuation to the signal (input or tape) fed to the vu meters, LINEOUT jacks, and headphones. This allows easy calibration changes to accommodate either conventional or high-energy tapes. Tape editing is greatly simplified in the ATR-700. Pressing the EDIT button during reproduce mode disables the takeup motor and allows dumping of unwanted tape from the supply reel. The EDIT button also causes the tape lifter to be retracted to allow manual cueing in stop mode. A VARI-SPEED control can be used to vary tape speed by ±5% in order to compensate for tonal variations of instruments recorded at different times. Other important features of the ATR-700 include: a rewind-stop MEMORY switch; full remote control capability (using the optional remote control box); quick-lock reel holddown knobs; a flip-open head housing to facilitate editing and head maintenance; a cue mode; a pause mode, to prepare for record or reproduce operation; and a universal power transformer which allows the ATR-700 to accept 100, 120, 220, or 240-Vac input at a frequency of either 50 or 60 Hz. Foundational text courtesy of the AMPEX ATR-700 operation and service literature. 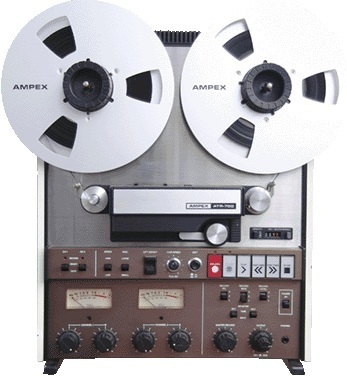 Do you have content, to add, about the Ampex ATR-700 Tape Machine or associated topics? Please feel free to Share it, here!